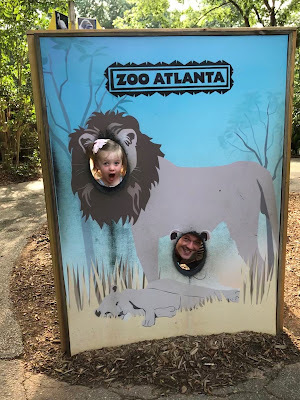 We had been discussing going to the zoo for forever and finally nailed down a day to go while Honey was in Georgia. We are now members (thanks Honey!) so we can go into the park early on Sunday mornings before its hot and crowded. Little Miss had NO idea what she was in for!! She hopped in and out of the stroller at every exhibit. Sometimes the terrible twos are really tough.. and some days they are just so stinkin special. FAVORITE picture from the day. That girl does not lack in the personality department. I have a picture in this exact spot about 20 years ago.. I need to find it and do a comparison! E wanted me to capture the moment she got within 10ft of a snake! ha! The gorilla exhibit was definitely my favorite. Those creatures are so human-like it's insane. I could have watched them for hours! Maddie Jane's first dippin' dots experience! The petting zoo was precious.. I think MJ could have spent her entire day brushing the sheep and goats! We were headed out the park and E suggested we swing back by the elephants one more time.. and I'm so glad we did!! We caught "Kelly" the elephant getting a bath. We got to see her do all of her commands up close and personal. SO cool. And no trip to the zoo is complete without swinging through the gift shop. I was so surprised when MJ chose a lion to come home with her! It was the BEST day at the zoo! We have plans to go back several more times this year!